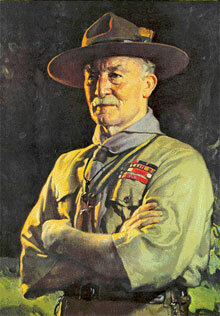 Who was Lord Baden-Powell ? He was a decorated soldier, talented artist, actor and free-thinker. Most of you may be familiar with this great personality, Robert Stephenson Smyth Baden-Powell, who is known as the Chief of Scouts today.He is respected throughout the world as a man who in his 83 years led two separate and complete lives, one as a soldier fighting for his country, and the other as a worker for peace through the brotherhood of the Scout Movement. Best known during his military career for his spirited defense of the small South African township of Mafeking during the Boer War he later came into extraordinary fame as the Founder of Scouting. Born on February 22,1857 in Paddington, London,he was the sixth son and the eighth of ten children of the Reverend Baden Powell, a Professor at Oxford University. When his father died B-P as he was popularly called was only three years old. He began to exploit his interest in the arts of scouting and woodcraft at an early age.Not known for his high marks at school, B-P nevertheless took an examination for the Army and was placed second among several hundred applicants. In 1876 he went to India as a young army officer and specialised in scouting, map-making and reconnaissance. His success soon led to his training other soldiers.Returning home in 1903 he found that he had become a national hero. He also found that the small handbook he had written for soldiers -Aids to Scouting was being used by youth leaders and teachers all over the country to teach observation and woodcraft. B-P rewrote his book, Aids to Scouting, to suit a younger audience. In 1907 he held an experimental camp on Brown sea Island, Poole, Dorset, to test how practical his ideas were. He rallied together around 22 boys, some from private schools and some from working class homes, and took them camping under his leadership. The results of that camp are no secret to the whole world today because of the existence of the scouting movement. His book Scouting for Boys which was published in 1908 in six fortnightly parts made a tremendous impact on the youth, Young boys formed themselves into Scout Patrols to try out his ideas. What had been intended as a training aid for existing organisations became the handbook of a new and ultimately worldwide Movement. B-P's great understanding of boys obviously touched something fundamental in the youth of England and worldwide. "Scouting for Boys" has since been translated into more than 35 languages. The first international Scout Jamboree took place at Olympia, London in 1920. At its closing scene B-P was unanimously acclaimed as Chief Scout of the World. * It was at the third World Jamboree, held in Arrowe Park, Birkenhead, England, that the Prince of Wales announced that B-P would be given Peerage by the King. B-P took the title of Lord Baden-Powell of Gilwel. The Gilwell Park was the international training centre he had created for Scout leaders. * B-P wrote no fewer than 32 books. He received honorary degrees from at least six Universities. In addition, 28 foreign orders and decorations and 19 foreign Scout awards were bestowed upon him. * On January 8th, 1941, at 83 years of age, B-P died. He was buried in a simple grave at Nyeri within sight of Mount Kenya.The head-stone on his grave carries the following words - "Robert Baden-Powell, Chief Scout of the World".It is surmounted by the Boy Scout and Girl Guide Badges. * Lady Olave Baden-Powell carried on his work, promoting Scouting and Girl Guiding around the world until her death in 1977. She is buried alongside Lord Baden-Powell at Nyeri.